The Akita (also known as “Akita Inu” or “Japanese Akita”) is the largest and best known Japanese breed. The Akita was bred as a fighting dog in medieval times, and redeveloped in the 1800’s as part of an effort to restore several ancient Japanese breeds. In 1918, the Akita Inu Hozankai Society of Japan was created to preserve the breed, which was subsequently designated a natural Japanese monument in 1931. In 1937, Helen Keller’s guide dog became the first Akita to arrive in the United States. The Akita grew in popularity in America after World War II, when many soldiers returned home from Japan with them. Today, they are popular American pets and serve as guard and police dogs in Japan. The world’s most famous Akita, Hachiko, greeted his owner at a train station after work every day. After his owner’s death, Hachiko continued to faithfully visit the train station every day to wait for his owner, until he died nine years later. Today a statue of Hachiko stands at the train station and an annual ceremony is held in his honor. The Akita has a shoulder height of 61-71 cm (24-28 in) and weighs 35-50 kg (75-120 lbs). Akitas have small, triangular shaped eyes, flat skulls, and a level back. Their ears are small, angled, and erect. The Akita has a large, full, curly, tail which dips above or below the back. Akitas have webbed feet which make them effective swimmers. The Akita has a double coat—the outer coat composed of straight and coarse hair, and the undercoat soft and dense. The hair on the head and legs is short. Permitted colors for Akitas are red, white, and streaked. Pinto is accepted for the American breed, but not the Japanese breed. The Akita sheds its coat twice a year. Akitas have a strong hunting instinct and are calm, spontaneous, and intelligent, making good watchdogs. They are quiet and dignified, with great power and attentiveness. Akitas are noble and kind, making excellent companions. They are generally obedient. Barking is infrequent; however they tend to make a mess when drinking! Akitas have a strong hunting instinct and are calm, spontaneous, and intelligent, making good watchdogs. They are quiet and dignified, with great power and attentiveness. Akitas are noble and kind, making excellent companions. They are generally obedient. Barking is infrequent; however they tend to make a mess when drinking! The Akita is brave and smart, and requires a lot of human companionship. Akitas should be allowed to live indoors (though they can tolerate the outdoors in cool climates) and given plenty of attention. They are highly protective and territorial. Akitas prefer not to have other dogs around, and should become acquainted with cats and other household pets early in life to avoid aggressive behavior. They get along with children, preferably older children, but they must be given personal space. The Akita is not fond of strangers. You can find Akita puppies priced from $200 USD to $4500 USD with one of our credible breeders. Browse through our breeder's listings and find your perfect puppy at the perfect price. The Akita is brave and smart, and requires a lot of human companionship. Akitas should be allowed to live indoors (though they can tolerate the outdoors in cool climates) and given plenty of attention. They are highly protective and territorial. Akitas prefer not to have other dogs around, and should become acquainted with cats and other household pets early in life to avoid aggressive behavior. They get along with children, preferably older children, but they must be given personal space. The Akita is not fond of strangers. The Akita should be brushed weekly to remove dead hair, and should be groomed with a metal-toothed comb twice a year, when it is shedding. To avoid removing natural oils from the coat, it should be bathed lightly with a mild shampoo only when absolutely required. The hair on the bottom of the webbed feet should be trimmed occasionally. Akitas are prone to hip dysplasia and may encounter eye and knee problems. Akitas have litters of 5-7 pups and a life span of 9-11 years. A confident and consistent approach is required to train an Akita. Repetitive drills or overly harsh training hinder the process. Akitas are easily housetrained. They must be socialized young if they are to live with other pets. 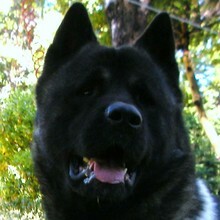 Akitas have considerable stamina and should be physically and mentally stimulated as much as possible. They should be walked on a leash or provided an enclosed area for activity. Akitas enjoy active playtime with family. They can adapt when not exercised for a time, but may be less quiet and obedient. Akitas can tolerate apartment life provided they receive sufficient exercise. Akita Puppies for Sale - Shipped Worldwide! Finding the right Akita puppy can be dog gone hard work. PuppyFind® provides a convenient and efficient means of selecting and purchasing the perfect Akita puppy (or Akita puppies) from the comfort of your home, 24 hours a day, 7 days a week. Take advantage of our PuppySearch or leisurely browse our directory of hundreds of dog breeds, Akita dog breeders, Akita dogs for adoption, and Akita puppy for sale listings with photos and detailed descriptions. Some Akita puppies for sale may be shipped Worldwide and include crate and veterinarian checkup. Many Akita dog breeders with puppies for sale also offer a health guarantee. With thousands of Akita puppies for sale and hundreds of Akita dog breeders, you're sure to find the perfect Akita puppy.